In Rogue Nation, the IMF is dissolved and Ethan Hunt is being hunted by the CIA. Hunt’s mission is to prove the existence of the Syndicate, and his mission leads him to an undercover MI6-agent that he teams up with. That is the basic premise of the fifth installment in the Mission: Impossible-franchise. Let’s start with what I didn’t like about this film, and, thankfully, that is not a lot. I realize that I may be in the minority here, but here’s the thing: I really don’t like the villain in this film. Hear me out. The very best spy-films have great memorable villains, like Le Chiffre in Casino Royale or Auric Goldfinger in Goldfinger, but I don’t find this villain memorable. It’s got nothing to do with Sean Harris’s performance as Solomon Lane, but Lane just isn’t menacing nor does he feel particularly scary. And I wonder if the reason I feel that the villain is bland, generic, and definitely not memorable is that I find Ethan Hunt to be ‘overpowered’ in this film. Look, I’m not saying the spy-star in a film has to die, but there is a limit to what feels ‘believable’ – you cannot have Ethan Hunt survive everything without consequence. But those are minor issues that I have with the film, so let’s now get to what works in this film. First off, I love how this film isn’t just about Ethan Hunt. This film proved that you can have a spy-film focused on one agent in particular, but with his own team not standing in the background. Every member of the IMF-team gets a moment, as well as something to do. Ving Rhames, Simon Pegg, and Jeremy Renner were all great in the film, and I thought that the latter two delivered great performances in this film. Tom Cruise is back. Tom Cruise must love this franchise. Every time he gets to do his own stunts, he gets to be a spy-star almost at the size of James Bond, and he is brilliant each and every time. I’ve yet to see him phone-in a Mission: Impossible-performance, and when his action career is over, then Cruise should be recognized as one of the very greatest action stars of all-time. This really is the year of great Swedish actresses. Alicia Vikander has already had a great year with a number of films, including EX_MACHINA, and in this film Rebecca Ferguson joined the Swedish party. Rebecca Ferguson’s character, Ilsa Faust, is a smart, strong female character that is actually quite memorable. And I do think that is something we should commend this movie for. Female leads in spy-films don’t need to be just Hunt or Bond-girls. You don’t just write them up to be pretty faces for the agents to fall in love with. This film does a great job of creating a strong female heroine, and one could argue that Rebecca Ferguson gives the most memorable performance in the entire film. I was also impressed by the little touches of brilliance in the film. Like, for example, how well-orchestrated the action sequence inside the opera is. If you didn’t think Nessun Dorma could work in a spy film, then this film proves you wrong. Rogue Nation is not just a big turn-your-brain-off action-comedy. No, it is in fact a smart, thrilling, and captivating attempt at filmmaking. 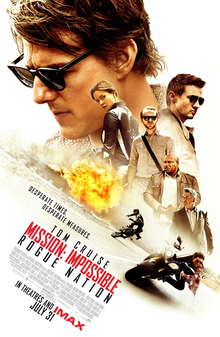 It is funny, it is breathtaking, and it solidifies Ethan Hunt as America’s James Bond.